I was happy to be able to finally come back to Belize to help with this workshop during the winter when I have a one month break in my busy teaching schedule. Thankfully, this event was largely sponsored by the generous donation of Dr. Ed Barnhart and the Maya Exploration Center (MEC), with whom I work leading student trips throughout the world, and we decided to combine our efforts in having me both lead a student trip and provide workshop instruction at Maya Centre. This was a fruitful partnership between MEC and MAM that we hope to continue in some capacity in the future. Ernesto opened the workshop with a heartfelt ceremonial circle, and candles of different colors were lit surrounding a beautiful altar made from the winding, polished roots of an enormous tree. Maya Centre sits just outside the Cockscomb Basin Jaguar Preserve, within view of Victoria Peak, and we were surrounded by birdsong and the lush forest and gardens while we worked. At one point, I spoke about the murals of San Bartolo, not far from Belize in Guatemala, and none of the participants had seen or heard of these remarkable images. When I shared with them my slides of the murals, I was moved to see their many expressions of emotion, gratitude, and recognition. 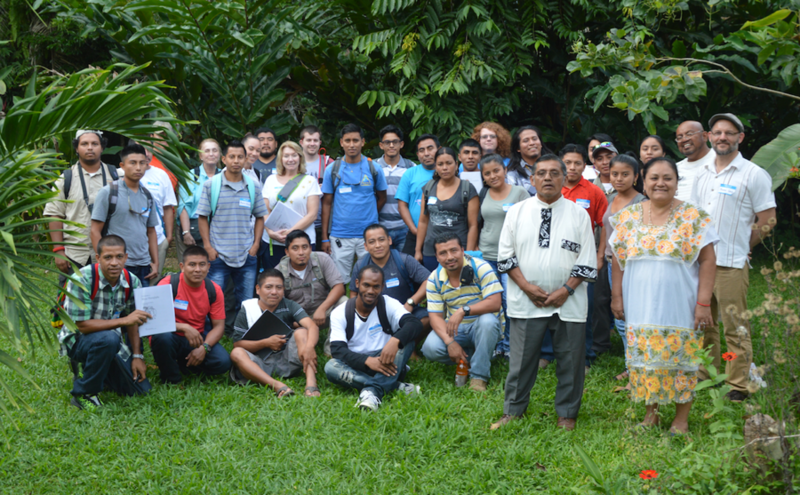 Many of the participants remarked at the familiar flora and fauna that still exists in Belize, and the symbolism of reciprocity that continues in their own Maya traditions. Without widespread access to this kind of information, they crave to see and learn about these kinds of images, and I realized that the simple act of sharing what I have been privileged to learn and store on my laptop can mean so much to them. Upon their request, I was able to email the multiple presentations to all of the participants following our meeting. 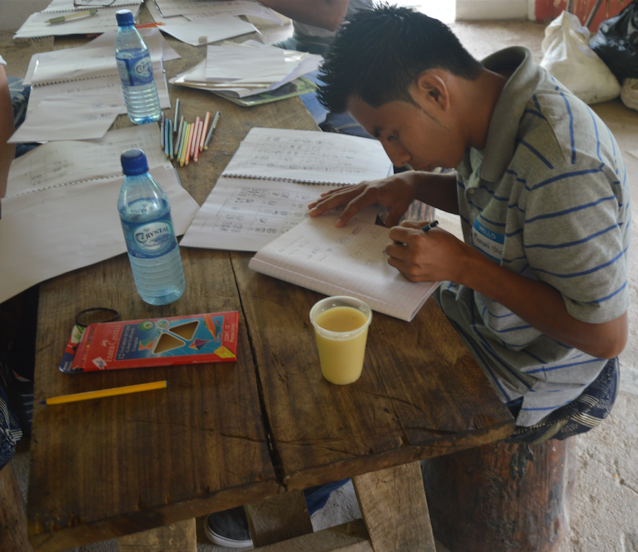 Francisco Alvorado studies the syllabary. 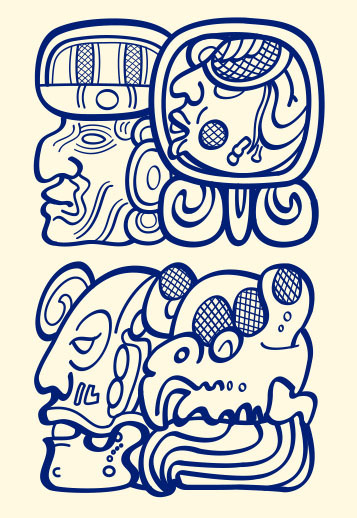 Manuel Choco spells his name in glyphs. Fidalia Coc draws a perfect glyph. 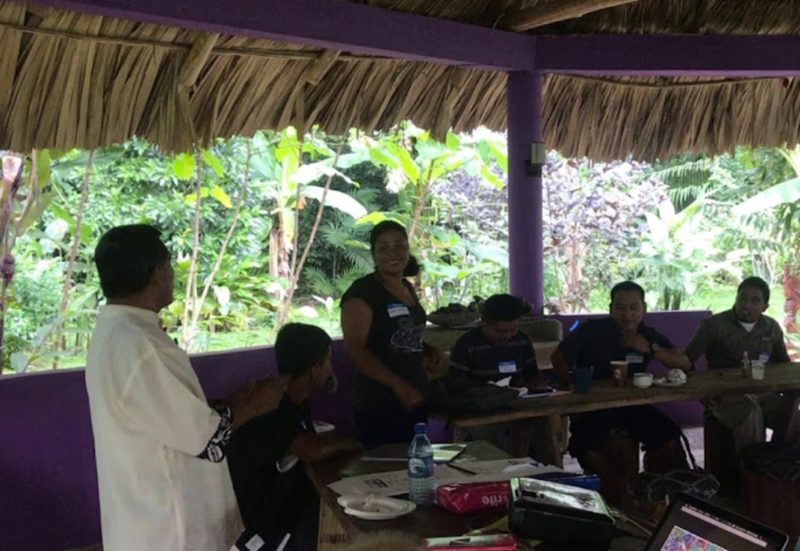 Many Maya people in Belize operate as tour guides to prominent sites such as Caracol, Nim Li Punit, Altun Ha, and Lamanai, and most of the participants in our workshop are also tour guides. 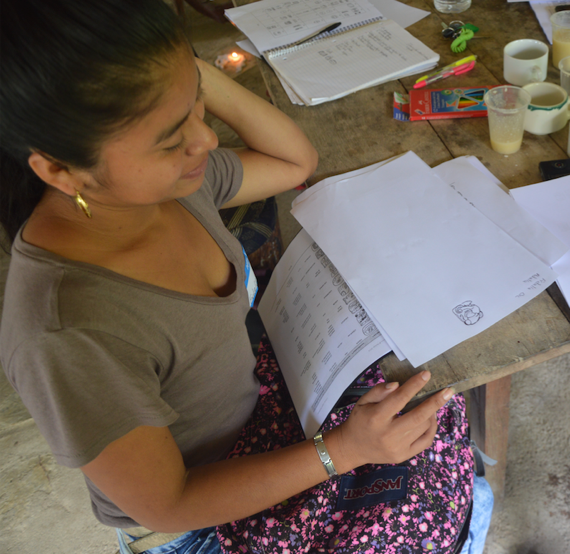 Most of them had not had prior instruction in reading and writing the Maya script, since there is very little access to this information in Belize. I began the workshop with some history of the decipherment of the script, followed by an exploration of the syllabary and instructions about how to write their names using syllabic glyphs. 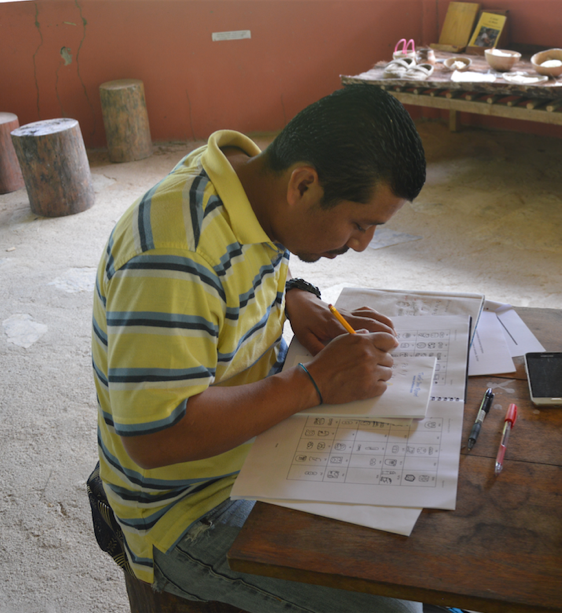 One participant, Salucio Chiac, plans to utilize his newfound knowledge of the Maya script to transcribe the name of his business. The workshop continued with an analysis of how to decipher the Initial Series and Supplementary Series, with particular emphasis on Maya calendrical cycles. 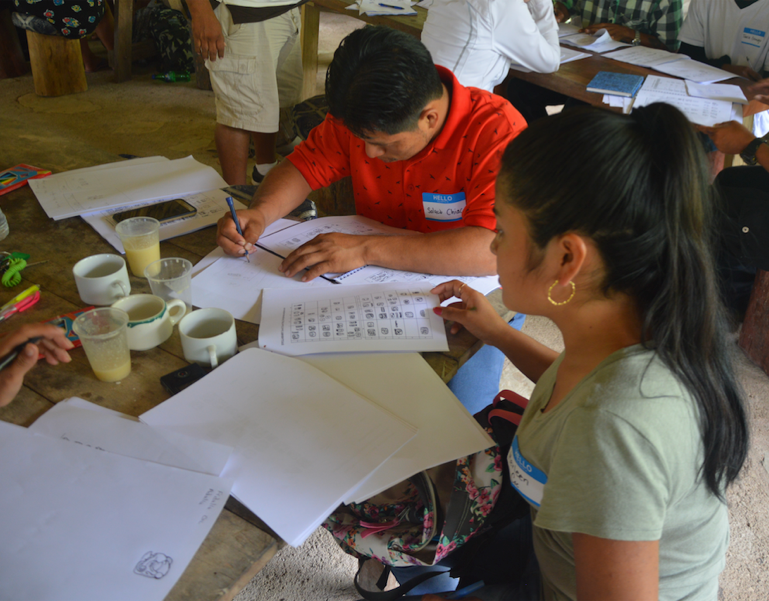 Participants were given a workbook with multiple drawings of stelae and monuments, including several inscriptions found in Belize. 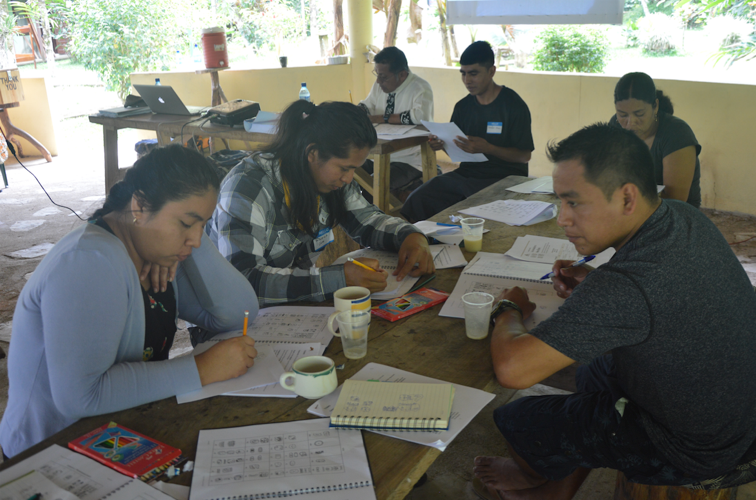 Following a delicious traditional lunch served by our gracious hosts at Nuuk Che’il, our program concluded with a thorough analysis of the Tablet of the 96 Glyphs from Palenque, with participants color-coding the various identified components, including Calendar Round dates, distance numbers, royal names, and emblem glyphs. Salucio Chiac and Merleen Coc. Diana Salam, Jeremiah Chiac, Franciso Chub in front. Ernesto Saqui, Telesforo Chiac and Marleni Emillian in back. Michael Grofe demonstrates color coding the Tablet of the 96 Glyphs. Our workshop ended as it began, with Ernesto gathering us all once again in a circle, asking the participants to speak about their experiences at the workshop. Here are some of their testimonies, which my student, Dominique Iraci, thankfully captured on video. Ernesto Saqui and Merleni Emillian at the closing ceremonies. Regretfully, I do not have a transcription of Ernesto’s opening or closing statements, or his sharing of Mopan practices that were reflected in the images of the San Bartolo murals. However, he mentioned that when a hummingbird flies nearby, it is thought to be the ancestors letting us know they are there, joining us. In fact, when our session came to an end, I couldn’t help but notice a hummingbird darting just behind Ernesto as he spoke. 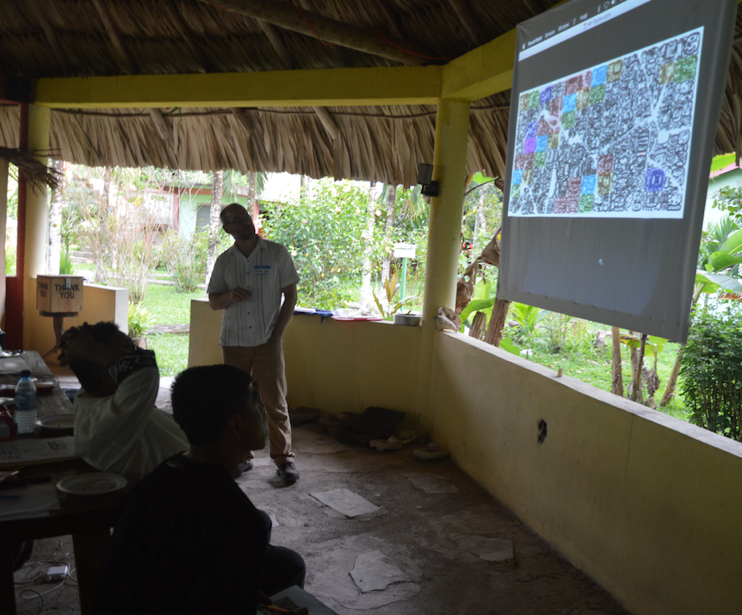 It was a rare privilege for me and my students to participate in this workshop, and I look forward to the opportunity to return to Belize in the near future. 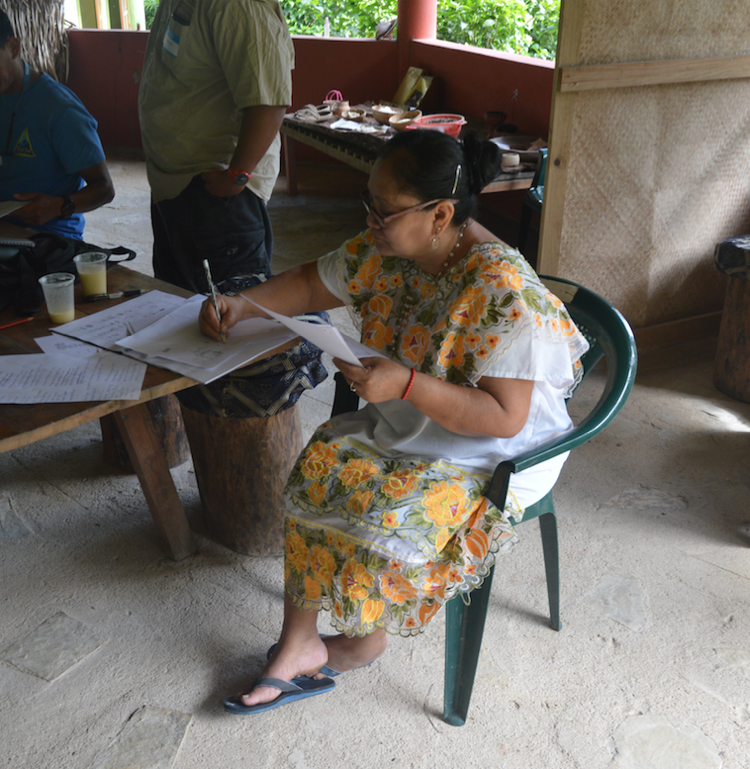 All of us look forward to a future where Maya people in Belize are regularly teaching one another to read and write in the script of their ancestors. Much thanks to Ed Barnhart for sponsoring this event with MAM, and great thanks to Ernesto and Aurora Saqui for hosting us and treating us to a delicious lunch in their beautiful meeting space at Nuuk Che’il Cottages in Maya Centre. Thank you to Dominique Iraci for the beautiful photographs, and thanks to all of my students for helping out, and a great thanks to all of the many participants who made this event so very special. Our gracious hostess, Aurora Saqui.